Dentures in Casper vs. Partial Dentures — What’s the Difference? Full dentures replace an entire arch of teeth. That is to say, they replace either all of the upper or all of the lower teeth. They consist of a gum-colored base and a series of artificial teeth. Partial dentures replace just a few teeth. The teeth do not all have to be adjacent to each other; a partial denture can be fitted so that it replaces teeth throughout the arch. 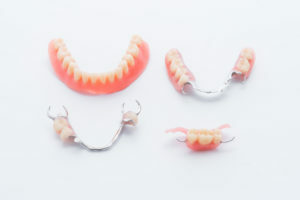 Partial dentures may contain metal parts to help them fit securely in the mouth. The type of denture that is right for you depends solely on your circumstances. If you are missing all or even most of your teeth, full dentures are the better choice. For folks whose tooth loss is less severe, a partial denture might be the perfect solution. Once you decide that dentures are right for you, your dentist will take some impressions of your mouth and use that information to design your new teeth. A laboratory will create your denture and send it back to our office. You’ll come in for a fitting, and we’ll adjust the dentures so they are as comfortable as possible. The entire process may take a few appointments over the course of several weeks. Whether you choose to receive full or partial dentures, you can expect to go through an adjustment period with your new teeth. If you experience any problems or discomfort along the way, don’t hesitate to call your dentist for advice. Keep your dentures moist when you are not wearing them; it’s a good idea to place them in a special denture-soaking solution every night. Brush your dentures gently to remove food particles and prevent stains. Keep your gums and any remaining natural teeth clean through brushing and rinsing with mouthwash. Either full or partial dentures may be just what you need to regain your missing smile! If you’d like to learn more about your tooth replacement options, please contact Dr. Erin Prach’s office at 307-337-4770.